Close to 500 people attended this big festive occasion to celebrate God's gracious gifts of hard work and sacrificial giving to make Radio Logos a fruitful and dynamic voice all over South America! Taller de radio Chazuta from ILMAV on Vimeo. Peru: Ethnic owned and operated radio stations. A typical Radio station is made up of the following components. Antenna farm, Recording Studio, Broadcasting Studio, Music & Program libraries, Training of DJs and station technicians, Antenna-to-studio radio link, and a reliable local electrical grid. The Goal is to build one new radio station and renovate one station each year. 2015 saw Quechua FM Radio Station completed in Llata, Peru.The antenna site is 13,000 feet above sea level. It will cover well over 100 villages. This is the only legal radio station in the area. 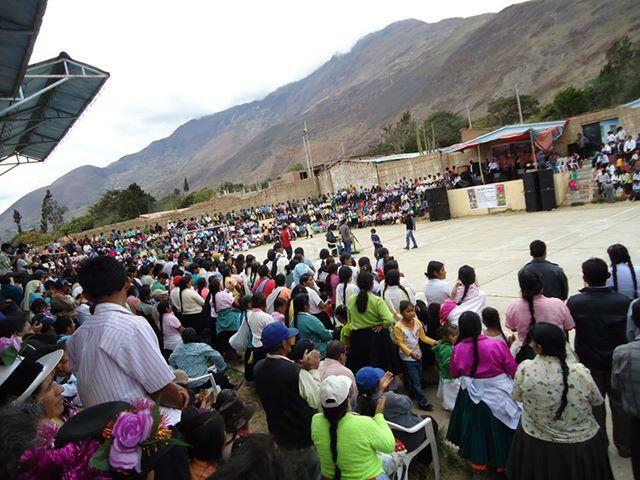 The Quechua FM Radio Station in Huanuco is owned by Pastor Rubin Matias. During the Communist take over in Peru many of his colleagues were gunned down by the guerrillas. They planned to kill him as well. He asked, “And what kind of a threat is a blind man to you?” His radio station has been on the air for 18 years. The government just fined him for the antiquated antenna-to-studio link plus operating on an unauthorized frequency. I met him in Lima at the Ethnic Radio Conference. He has an awesome baritone singing voice and plays the accordion well. They really need our help. $5,750.00 will do it. He and his wife make an awesome team. Thank you for your tender loving care. Pray for these to be funded and completed soon. FM Station for Chazuta to cover the first 40 miles the Shortwave skips over. Ongoing training for Ethnic Quechua and other people that desire to evangelize using recordings and radio media for scriptures. Complete the recording studio near Leticia Columbia for Scripture recordings for various groups hidden in the jungles. Wouldn't it be wonderful to have all these communities experience what it means to be really free? ! !